The "Mia Desgagnes" suffered a blackout, caused by a malfunction of the shaft generator, on the Lake Ontario, Ontario, in position 43 45 54 N, 77 34 48 W,on Nov 14, 2018, at 1.55 p.m. The crew was able to effect repairs and continue the voyage. The ship berthed in Montreal later and proceeded to Oakville on Nov 22. The "Mia Desgagnes" suffered a total failure of the main engine in position 045 33 25.4 N, 073 30 41.6 W, north of Port de Montreal, on Nov 1, 2018, at 07.55 a.m. The crew dropped anchor near the Port de Montreal at Pointe-aux-Trembles and reported smoke emanating from the pump room. The smoke was caused by a faulty electric motor. The "Mia Desgagnes" suffered a total failure of its main engine seven nautical miles west of Cacouna, Quebec, in position lat 47 55 00N, long 69 43 00W, on Apr 1, 2018, at 11.06 p.m. 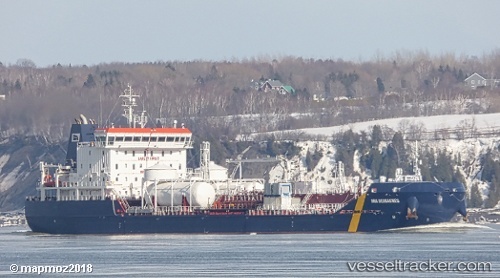 The vessel anchored off Cacouna, Quebec for repairs. It arrived at Pointe aux Trembles on Apr 3.